Before President Obama nominated Garland on March 16, Senate Republican leaders had vowed to not consider anyone Obama chose, saying the confirmation of a new justice should wait until after a new president takes office. Senate Republican leader Mitch McConnell reaffirmed that position after Obama’s selection of Garland. Last month, 56% of the public said the Senate should hold hearings and vote on Obama’s choice to replace Justice Antonin Scalia, who died Feb. 13; 38% said the Senate should not hold hearings until the next president selects a nominee. Partisan differences over Garland’s confirmation are wider than for Obama’s previous court nominees, Elena Kagan and Sonia Sotomayor. Currently, 70% of Democrats say the Senate should confirm Garland to the Supreme Court, compared with just 22% of Republicans. The latest national survey by Pew Research Center, conducted March 17-27 among 2,254 adults, finds that a majority (56%) says the choice of the next Supreme Court justice is very important to them personally. That is little changed from last month (57%), but much higher than in April 2010 (40%), before Obama named Kagan as the replacement for Justice John Paul Stevens, who retired. Among those who have heard a lot about Garland’s nomination – 32% of the public – 61% favor his confirmation, while 33% are opposed (6% offer no opinion). Among the majority of the public who have heard little or nothing about his selection, opinion is more mixed: 39% say the Senate should confirm Garland, 28% say it should not, while 33% do not express an opinion. Blacks are far more likely than whites to say the Senate should confirm Garland to the high court (62% vs. 43%). In addition, there are educational differences in opinions about his nomination. Majorities of those with postgraduate degrees (62%) and college degrees (54%) favor Garland’s confirmation, compared with just 42% of those with less education. Opposition to Garland is similar across educational groups, but those with less education are less likely to express an opinion. Opinion about Garland’s nomination is similar to views of Sotomayor shortly after Obama nominated her to the court in June 2009. 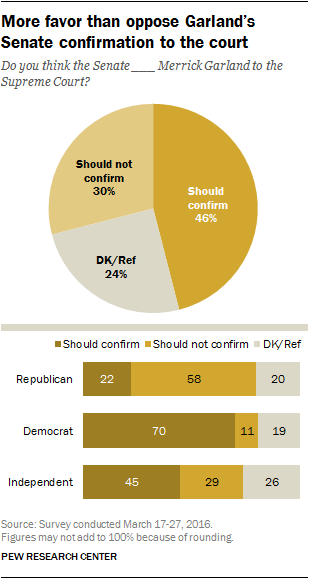 At that time, 50% said the Senate should confirm Sotomayor, while 25% said it should not (25% said they did not know). Kagan, nominated by Obama in May 2010, was initially not as well-known as either Garland or Sotomayor. Nearly half (46%) expressed no opinion of Kagan’s confirmation, nearly double the shares not offering an opinion of Garland (24%) or Sotomayor. Overall, 33% said the Senate should confirm Kagan, while 21% were opposed. In November 2005, the public generally favored the Senate confirmation of Samuel Alito, George W. Bush’s choice for the Supreme Court (40% favored vs. 23% opposed), though a relatively large share (37%) had no opinion. Bush nominated Alito after withdrawing the nomination of Harriet Miers, who drew opposition from Democrats and engendered little enthusiasm among Republicans. In October 2005, 33% favored Miers’ confirmation, while 27% were opposed; 40% expressed no opinion. In September of that year, when John Roberts was being considered for Chief Justice, 35% said the Senate should confirm him, while 19% were opposed; nearly half (46%) had no opinion. 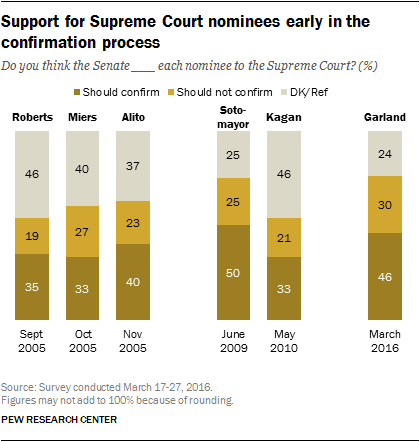 While there have been substantial partisan differences in opinions about Supreme Court nominees going back more than a decade, the 48-percentage point gap in opinions about Garland is the widest since Roberts’ selection more than a decade ago. The differences between views of Sotomayor and Garland, who were similarly well-known at the time they were nominated, are notable. 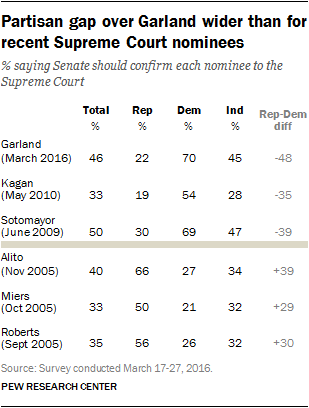 Democrats’ views of Garland are almost identical to their opinions about Sotomayor in 2009 (70% favor his confirmation vs. 69% for Sotomayor). Among Republicans, support for Garland is eight percentage points lower than for Sotomayor (22% now vs. 30% then), while opposition is 14 points higher (58% now vs. 44% then). A majority of Americans (56%) say the choice of the next Supreme Court justice is very important to them personally, little changed from when it was asked last month in the wake of Antonin Scalia’s passing (57%). Republicans (63%) are more likely than Democrats (56%) to say they consider the choice of the next Supreme Court to be very important to them personally. But nearly identical shares of liberal Democrats (67%) and conservative Republicans (68%) say the choice of the next Supreme Court justice is very important to them. As noted in the February report on opinions about the Senate’s handling of Obama’s court pick, young people are less likely than older adults to attach great importance to the choice of a Supreme Court nominee; similarly, there are educational differences in opinions about the importance of a court nominee.